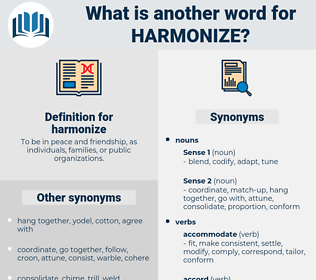 What is another word for harmonize? aligning, 'harmonisation, co-ordinate, coordinate, coordination. 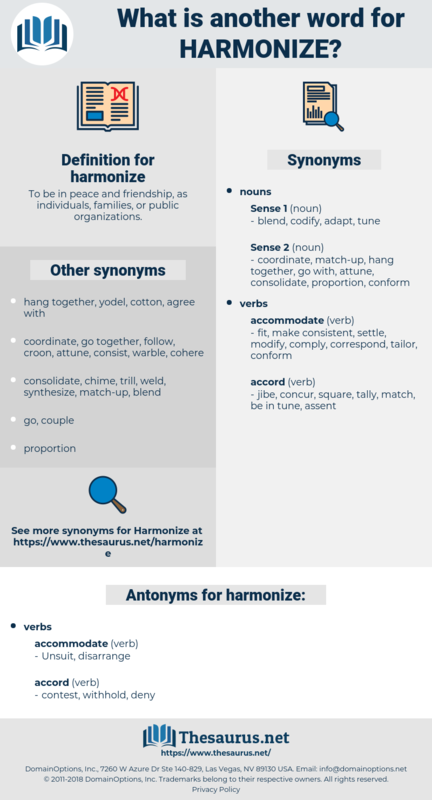 reconcile, lay, synchronize, standardise, streamline, realign, consolidate, integrate, orchestrate, rationalize, combine, conform, adapt, Adapting, adjust, co-ordinate, conciliate, coincide, accommodate, approximate, centralize, coordinate, comply, correspond, blend, tailor, coordination, reunite. dispute, disconnect, scatter, separate, conceal, refuse, disperse, divide, oppose. decline, conflict, nullify, counteract, contradict, contend, estrange, gainsay, contrast, diverge, disrupt, demur, counter, dissent, alienate, jar, skew, negate, disarray, protest, cancel, offset. Any other missive might have aroused her suspicion and made her more cautious, but flowers harmonize so well with a young girl's disposition that how could she refuse them? Inasmuch as such an advanced position does not always harmonize with the faith of his communicants, he has been proscribed in certain circles.